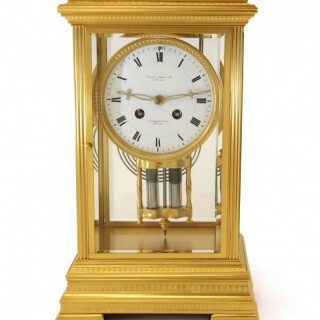 A fine gilded four-glass mantel clock with mercury pendulum, made around the turn of the 1900s. 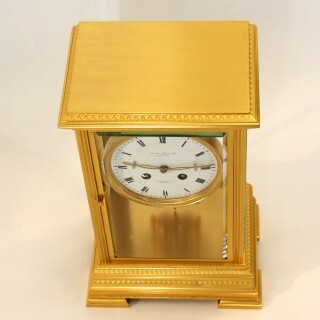 The clock is presented in pristine condition. 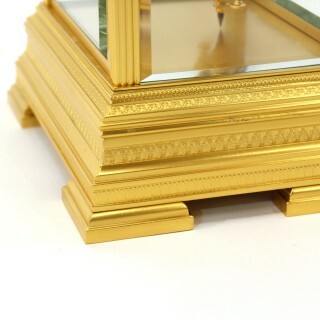 The newly regilded stepped case has engraved bands of three designs to the base and two to the plinth. 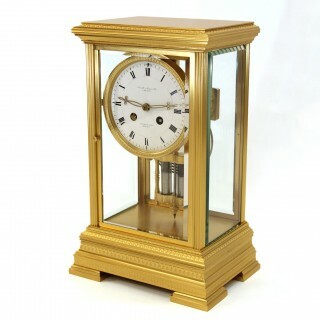 All four pillars are fluted, and the sides are fitted with heavy beveled glass, all in perfect condition. 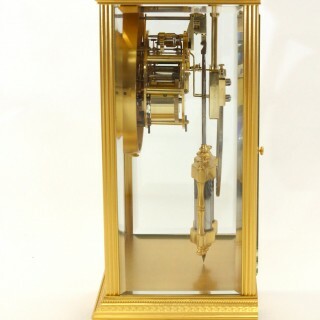 The extensive detailing on this case set it apart as a superior example of a four-glass clock. 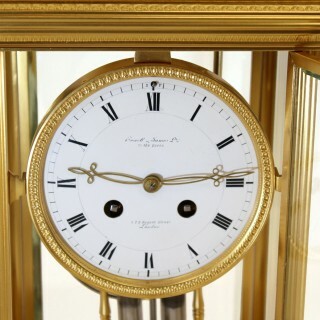 The clear white enamel dial has Roman numerals within an outer minute track and a fine regulation arbor above the XII. The centre is signed for the original retailer, Howell & James Ltd., To the Queen. Howell James & Company was a firm of jewellers and silversmiths had premises at 5, 7 and 9 Regent Street in London and operated between 1819 and 1911. In 1884 the company became a limited company and their name changed to Howell & James Ltd. The 8-day movement strikes the hours and the passing of the half hour on a gong. The back plate is stamped “MADE IN FRANCE”, a practice which came into common usage in 1891 due to the requirements of the McKinley Tariff Act passed in the United States. 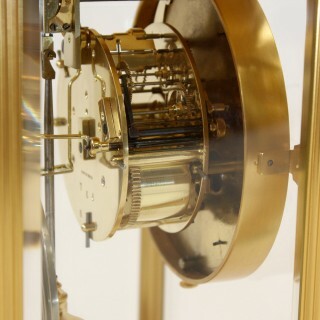 The movement is regulated by a gilded pendulum with two vials of mercury. 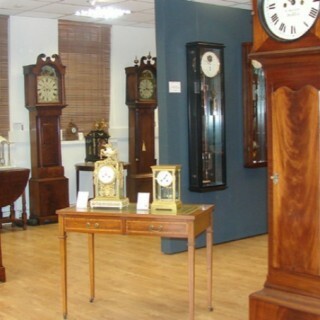 The use of mercury in pendula is to compensate for variations in temperature and is intended for better timekeeping.